Due to a fundamental change in the architecture of the Blackberry software, the synchronization of Contacts and Calendar entries between accounts is no longer supported. In the early days of a Blackberry, if you had a company email address that was connected to a Microsoft Exchange Server and a personal use account at Gmail, you could use the Google Sync App to keep the contacts and calendar synchronized between the two. Since the Blackberry device supports Gmail natively as a specific type of email account type, the functionality has significantly changed. RIM has taken the position that your Business Contacts and Calendar should be separate and apart from your Personal Contacts and Calendar. Each account you create on a Blackberry device gets its’ own email folder, calendar, and contact list. The problem is that RIM does not maintain this separation in the default view when displaying the Contacts or Calendars for business and personal items. In what I term, “Defective by Design”, the Blackberry commingles all personal and business contacts in one view. It does the same for all personal and business calendar entries. Even though you can select to display the Contacts or Calendar associated with just one account, i.e. your Gmail account, as soon as you return to the main menu or leave the contacts or calendar app, the selection changes back to “all.” This would seem to contradict RIM’s reasoning of personal vs. business because the default view for contacts and calendar events always commingles the personal and business accounts. It is interesting that in addition to having an “All Messages” commingled folder, the Blackberry device also has individual folders (App icons) for each mail account. Why they do not give the same option for quickly and permanently allowing one specific view, personal or business, for Contacts and Calendar entries as a default or as dedicated App button is a mystery. This is a problem because many people were previously using Google Sync to keep all of the Gmail Contacts/Calendar Events and all of the Microsoft Exchange Contacts/Calendar Events in complete and perfect synchronization. Make a change in one, and it magically appeared in the other. Because of the current Blackberry architecture, users see all of their Contacts and Calendar Entries duplicated unless they select just one of the views, personal or business every time the return to the Contact or Calender App. With the new architecture, each account and its corresponding mail, contacts, and calendar stand alone. Each account can sync back only to its’ respective Mail Server: Gmail or Microsoft Exchange. If you truly separate your personal life using Gmail and your business life using Microsoft Exchange on your Blackberry, then this is nothing more than an incredible annoyance. All of your Personal and Business Contacts and Calendar Events, by default, will display all of the time – unless you make a selection each time you enter the Contact or Calendar App. There will not be any duplicates but your personal and business life will be forever commingled in the display on your Blackberry. If you use want to use your Gmail Account and Microsoft Exchange account interchangeably, accessing the same set of synchronized contacts and calendar events, this feature will no longer be supported. 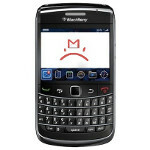 Google has announced that it will be discontinuing Google Sync for Blackberry effective September 1st, 2012. This will require you to do some serious housekeeping and separation of your personal from business contacts to avoid displaying duplicates on your Blackberry.